One of the reasons I’m so obsessed with old, air-cooled Volkswagens is the remarkable variety of vehicles that were built on the basic VW Beetle mechanicals. There’s been sports cars and SUVs and off-roaders and mine detectors and on and on and on. Today I want to introduce you to one of the least-known and most humble of the VW-derivatives: the Corcel 1600. There’s surprisingly little information online about these workhorses. They were built in Colombia, and most Google searches only bring up dead links to old ads selling one of these trucks, or many articles and pictures about the Ford Corcel. The Brazilian Ford Corcel seems like a pretty charming and fascinating car in its own right, and while I may write about it someday, right now I want to know more about this mysterious little work vehicle. This brochure gives some interesting answers, and brings up some interesting questions. Based on the listed specs, it’s clearly got a standard Volkswagen 1600cc upright-fan, air-cooled engine, just like in so many Beetles, Ghias, Buses, dune buggies, and innumerable other cars of the era. The listed power output, though, is very interesting: 67 horsepower. Now, that doesn’t sound like a lot to all of you modern go-getters, but for a non-hotrodded, bought-from-a-showroom Type I VW flat-four, that’s a downright monster. The most powerful Beetle VW ever sold in any official way was the Brazilian 65 hp 1600S Bizorrão—how does this modest, bare-bones little work truck have 2 whole hp more than that? To get that kind of output from a 1600cc Type I engine, you’d usually need either twin carbs or a double-barrel carb setup. Twin carbs aren’t exactly uncommon (VW Brasil sold Beetles with that setup, like the 1600S) so maybe they’re sourcing those, but that still doesn’t explain how this little Colombian company massaged an extra pair of horses out of there, or why a company making such utilitarian vehicles is bothering to source the highest-output engine from its supplier when a 50 HP basic one probably would have done the job just fine. Or, they could have just lied in the brochure? That’s the first mystery. The next mystery is what is the chassis like in this thing, and where exactly did they put the engine, and what wheels is it driving? See, I can tell from the pictures that they’re not using the standard VW backbone chassis. Since I have yet to find any pictures of a Corcel 1600 with the engine exposed, I have to piece together the layout and packaging from pictures. I’m pretty sure the engine’s not at the rear, though, based on the height of the truck beds, which are very flat and open. The Corcel came in three versions: a pickup, a stakebed, and a little box truck. Based on some ads I’ve seen, it looks like there was some sort of canvas-and-hoop-based system to turn a stakebed into a covered truck as well. The cabs of the truck appear to be made of fiberglass, and I think must have been pretty basic. I say this because the one thing the brochure mentions in the ‘Cabina’ section is a “panoramic windshield.’ If the windshield is the standout ‘feature’ of the cab, I wouldn’t expect power windows or anything. The styling is clean and utilitarian; it’s possible the doors are sourced from something else (I’ve heard Mazda 323 suggested), and from the few ads selling these I’ve seen, at some point much beefier bumpers seem to have been used than what’s shown in the brochure. I suspect this simpler one may be an earlier design? This one appears to be missing its bumper, which likely also housed the indicators. There’s something very appealing about these simple little beasts of burden. They seem very rationally designed to do a job with as little as possible, and I’d love to know more about them. I’m hoping we’ll have some Colombian readers who may know about the Corcel 1600. If you’re out there, please feel free to comment, post pictures, whatever! Let’s try and make some sort of more robust online presence for these interesting VW-derived trucks. It is rear-engined! And, the reason the bed can stay so low—and how it makes 67 HP—is because it’s not a VW Type I engine at all! It’s a Type III engine! Of course! It all makes so much sense now! Those did make 67 HP, and they had a much lower profile (fan on the crankshaft instead of above it)! I was a fool for assuming a Type I engine! The chassis still looks unique, as well as the coilover suspension setup. Daniel also suggested that the car was called the Corcel Cargo, which led me to this article. 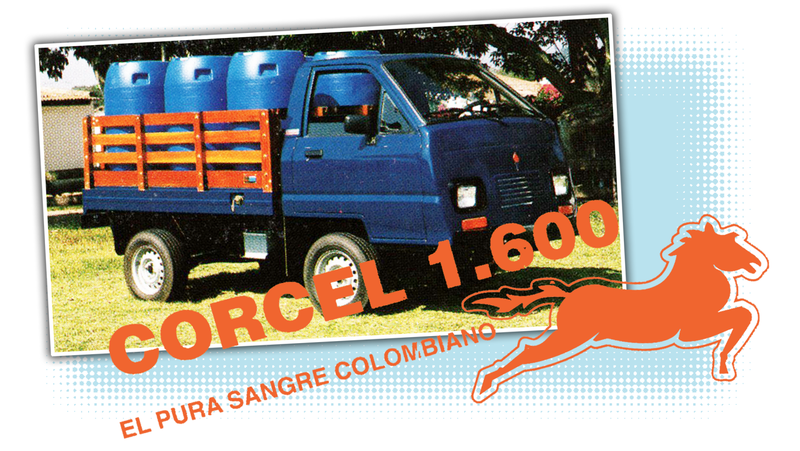 That article made it clear that the Corcel Cargo was a prototype for a Colombian-built utility vehicle, and was designed by Luis Alfonso Calderón in 1992. The front suspension seems to have come from a Chevette! It’s said only a few prototypes were built, which makes me wonder about the few I’ve seen for sale on South American sites. Were those from the batch of prototypes? Anyway, I’m sorry I was such a fool!